Music Pro Classic is the ultimate MP3 player, with LIVE TILE, LYRICS AND THEME SUPPORT! If you are tired of the built-in player, this application is for you. Very simple to use and it has all functions. Automatically scans the music stored in your phone and creates a library divided by songs, artists, genres, albums and playlists. In addition this also provides a search page for quick access to the song you want. On the page of listening, if any, are displayed album art and you can change songs through swipe gesture. 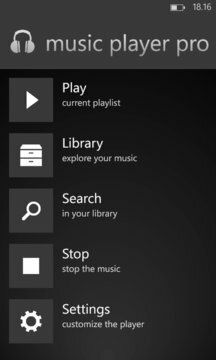 It seamlessly integrates with the system and also on the live tile shows the covers and track information currently listening.